Where Myrtle Ave starts at Grand Street. One of the best ways to get to know a city is to walk it. That's true for cities in which you've just arrived -- and cities in which you've lived for years. It'll change how you see a place. And to have the chance to walk across a city, mile after mile, at a leisurely pace, taking in what's around you? That is a rare opportunity. You might even consider it a luxury in a time-crunched world. One morning during AOA's recent summer break, I had a block of blessedly free hours. So I got together some friends and we walked Myrtle Ave in Albany -- one end all the way to the other. Why Myrtle? It's not "famous" like Pearl Street. It doesn't have the grandeur of State Street. It's not even a major artery, though it does see its share of traffic. But in a city of streets that have been broken into all sorts of segments over the decades, Myrtle is an exception: It runs (almost) continuously more than 2.5 miles through the city, across multiple neighborhoods and local historical eras. 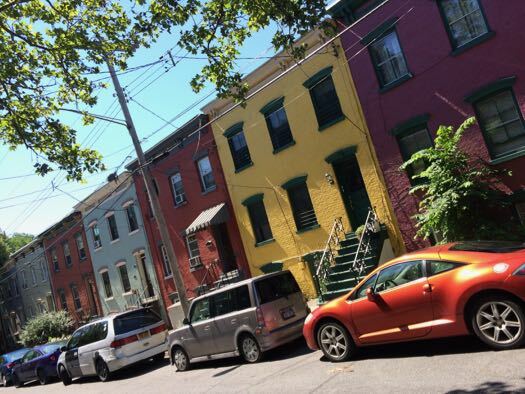 Traveling along Myrtle Ave is like taking a cross section of the city of Albany. It's a chance to see how the various shapes of parcels and buildings fit together. How neighborhoods suffering from poverty are connected to areas where wealth is common. It's another way of experiencing this place and mapping it in your head. Myrtle is one of the city's oldest streets, dating back to the late 1700s. 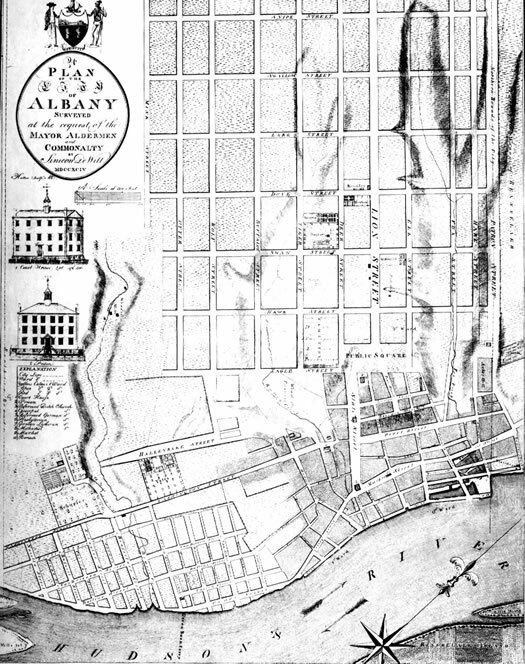 Portions of it show up on Simeon De Witt's 1794 grid map of the city, though it was called Mink Street then. It was called Monckton before that and would later spend some years as West Ferry Street before being named Myrtle. 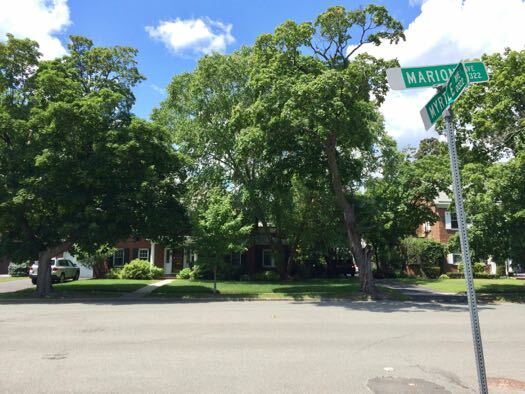 So it's fitting that Myrtle begins in one of the oldest sections of the city, at Grand Street in what we now know as the Mansion neighborhood, and makes its way up the hill past stately old row homes that date to the mid 1850s. One Myrtle Ave was built in 1860 (or thereabout) when the city's economy was going through a boom time. 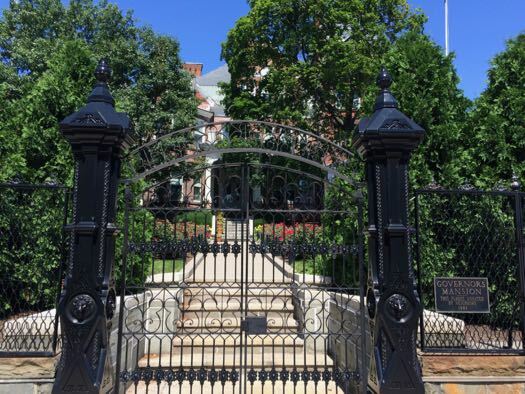 And the neighborhood has provided homes for successions of immigrant populations. The last half century hasn't been smooth. 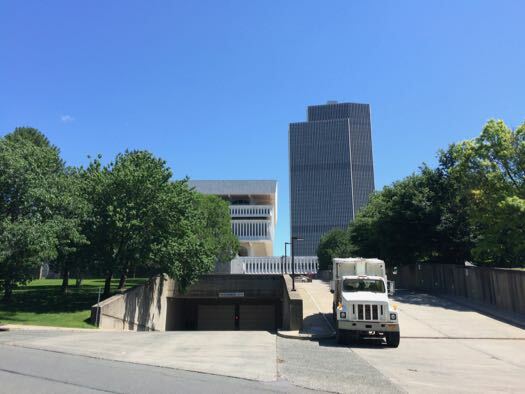 The construction of the Empire State Plaza cut off the neighborhood from downtown. The symptoms of disinvestment and poverty have taken their toll. Multiple buildings are stuck with the infamous red X. The latest Census estimates figure the median household income for the tract that includes this section of Myrtle is about $28,477 -- $57,708 for family households. 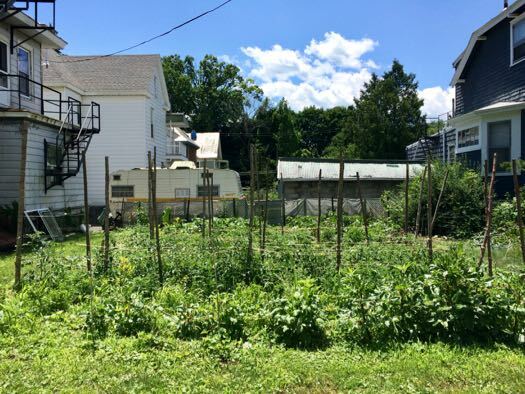 More than 40 percent of the people in living this tract are estimated to be below the poverty level -- including almost 75 percent of the kids here. And city tax assessments peg the value of residential buildings in the low to mid 100,000s (though there are certainly some exceptions, both higher and lower). 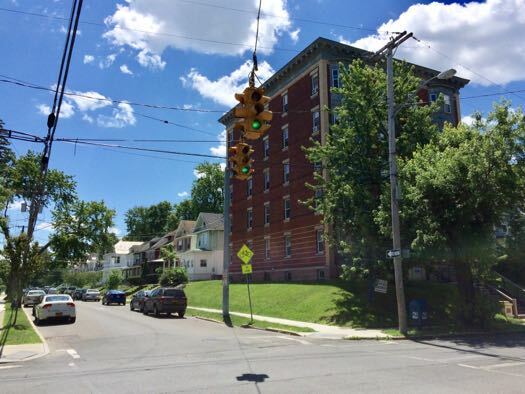 But like other Albany neighborhoods -- and neighborhoods elsewhere -- if you just stick to the major thoroughfares, skirting their borders, you're not getting the full picture. Walk up Myrtle through the Mansion neighborhood and there's life. Neighbors talking on stoops. Kids playing. Little pocket gardens. Delightfully maintained buildings. And obvious pride in the neighborhood. At the top of the hill is the the one break in Myrtle, at Eagle Street, where it runs into a mansion of a different sort. Myrtle once ran alongside what was called Beaver Park -- it's now Lincoln Park. But the construction of the ESP -- specifically the area around State Museum -- took a bite out of it. But we can follow the aptly-named Park Ave along the park to the other side. 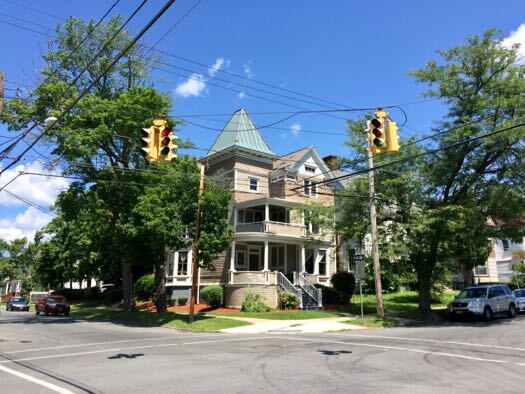 Myrtle picks back up again at Swan Street, which marks a different architectural style and era. The street is now lined mostly by two-story homes that don't stand right next to each other. They date to the 1910s. That brick complex on the corner -- with the late 19th century stable building -- is set to be converted into apartments. Crossing another major artery at Delaware means heading into more new architectural styles as the blocks get longer. Two-family homes that date to the 1920s line up opposite the Stratton VA Medical Center parcel. And a little farther up, after the intersection with the end of Knox Street, there are these cozy-looking connected row homes. 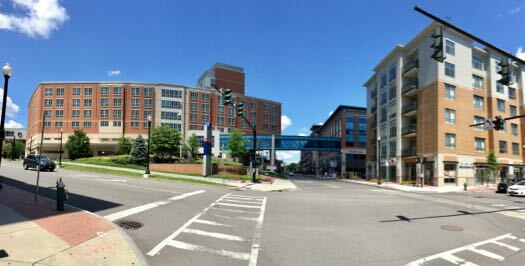 And as Myrtle approaches New Scotland Ave it arrives at Albany Med and the rising neighborhood urban center there. The addition of all the new buildings over the last decade has made that corridor feel denser and taller -- and also more uniform. Past Albany Med the strings of two-family homes grow more prominent, and Myrtle runs along the Capital District Psychiatric Center near South Lake. The large parcels on the south side of the street in this stretch have been institutional for a long time. The old penitentiary once occupied the space from Delaware to New Scotland, the Alms House -- and its hospital -- from New Scotland to Lake. And once perched near Myrtle Ave at South Lake: the second Dudley Observatory. From an 1895 map of the city. Myrtle is the street running along the edge of the alms house property. / via Wikipedia. Cross over South Lake and the feel of the street changes again. There are no more large institutional parcels. The structure of the neighborhood doesn't feel so tightly wound. It's homes along both sides. There are a few surprises along the streetscape -- like this building at Ontario Street. 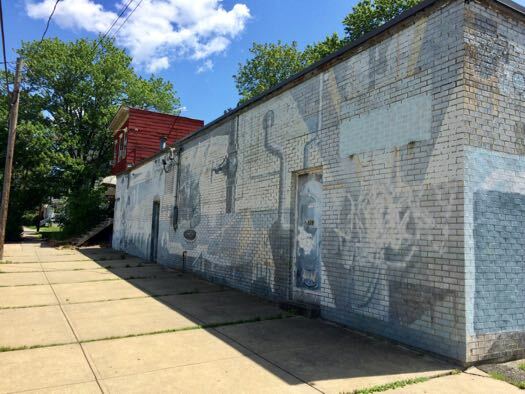 It's an old plumber's association hall -- as the building-wrapping mural indicates -- that's been repurposed as living space. 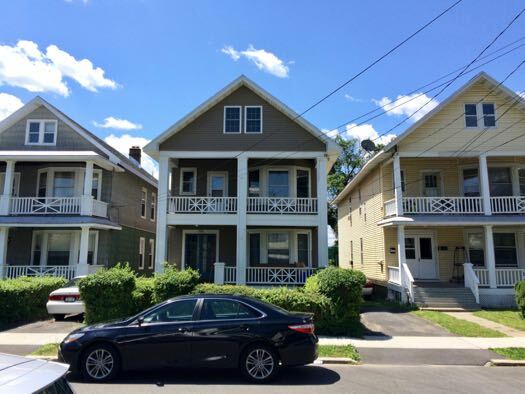 The Pine Hills blocks of Myrtle are full of those classic Albany two-family homes -- like these near Ridgefield Park -- that date to a building boom in the 1910s and 1920s. Having once lived in these sorts of homes, I think they're underrated. (I still sometimes miss our old second-floor apartment.) Two flats of 1,100-1,200 square feet, each with enough room for a few people. Buy one of the houses, live in one of the flats, and you can mostly cover the mortgage by renting out the other. Or that second flat could be space for other generations in the same family to live close by. These homes are all over the city and they make up an important part of the residential fabric of this place. But every so often along Myrtle there's also the odd apartment building -- like this 21-unit building at South Main that dates to the 1930s. 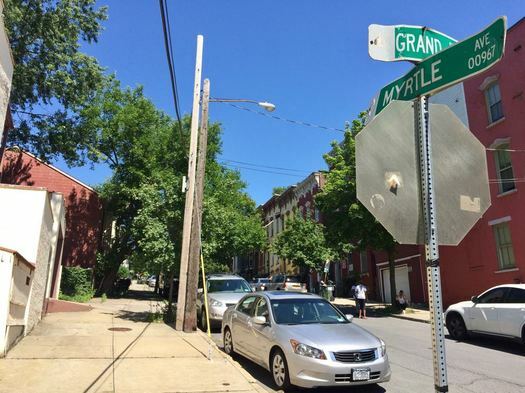 As you head farther up Myrtle, the mix shifts more toward single-family homes that date to the 1920s. Many of them are classic, beautiful city neighborhood homes. The streetscape continues to relax as you continue west. I always like to gawk at what's growing in this garden near South Allen. And the trees start to assert themselves more on the streetscape, like at the intersection with South Pine. After Pine, the houses start to stand even farther apart, suggesting the upcoming transition to a more suburban layout of the adjacent neighborhood, which was once the outer reaches of the city. This is one of the last two homes with a Myrtle address. It dates to 1933. And then Myrtle literally hits a roadblock before it meets Marion Ave. I suspect the barrier was placed here to keep drivers from cutting around the corner at Western and Manning (which people would certainly do if they could to avoid the light). 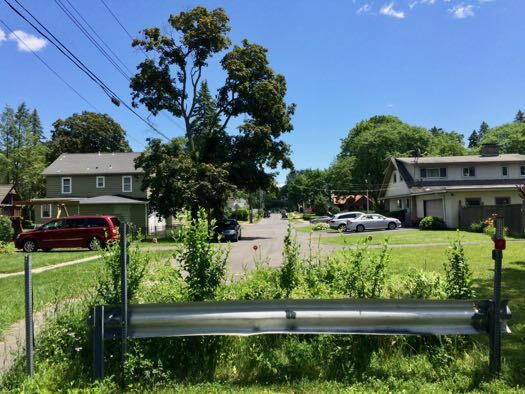 But I've also thought there's some unintentional symbolism to the barrier as well -- an actual physical dividing line between the small-lot, mid-priced neighborhoods of the city's mid-section, and the large-lot homes on Marion, which might be Albany's toniest residential street. And that's where Myrtle ends, on a boulevard-format street with homes valued at more than $300k in a tract with an estimated median household income of more than $60,000 (and more than $90k for families). It can seem like a completely different place from where the street started. But it's not. It's the same city, and the two points are directly connected by a thread that runs an almost continuous straight line between them. It's one thing to know that, to see it on a map -- it's another to walk it, to feel the distance isn't really that far, that you can cover the ground on foot in an hour or so. Greg Dahlmann is one of the editors of AOA. What a delightful read, thanks Greg! 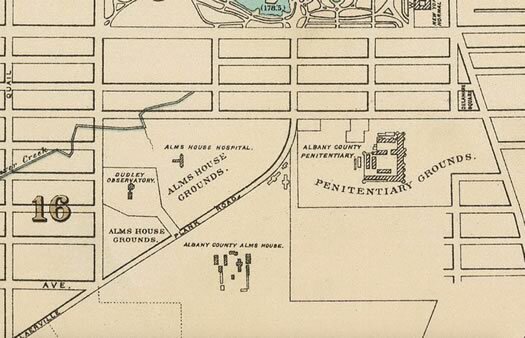 re: the 1895 map... never knew Albany Med stands on the former grounds of the county penitentiary! "Buy one of the houses, live in one of the flats, and you can mostly cover the mortgage by renting out the other." 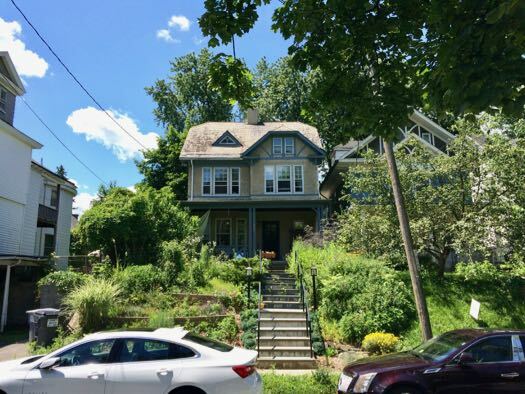 Being in the buyer's market currently, I can tell you that sadly most of what would be these gorgeous two-family homes (most of what's for sale, at least) have not been owner-occupied for a long time and have largely fallen into disrepair. If you find one that's habitable, it's $200k+ (so with Albany taxes that rental income isn't going to pay your mortgage), otherwise it needs a few tens of thousands of work (if it's even structurally sound). We have a real absentee landlord/"investment property" problem in Albany that I never hear any officials talk about. This was great to read! I enjoyed this article very much, Greg. We'll done! More like this please! I ride my bike down Myrtle quite often because it's such a nice long one-way road, although heavier traffic than I'd like. In Portland, OR in the SE section of the city there is a street called Clinton St that is local access only for cars, so you can drive onto the street but not pass through block to block, but is a thoroughfare for bicycle traffic. I've often thought that Myrtle could be used in this way very easily. 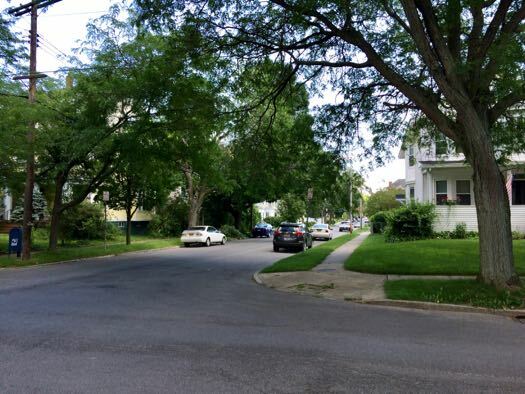 It's not the main automobile arterial with Madison a few streets over so it shouldn't affect cars too much, and it connects several different neighborhoods in the city. 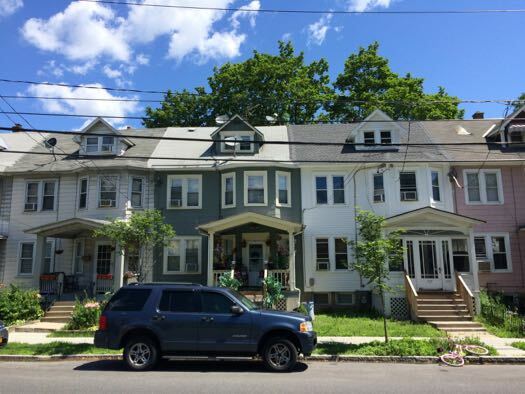 Home prices on Clinton St are double the adjacent streets due to the calmer traffic/noise. Now do it at night. I used to live at 811 Myrtle while in college. Great article! I enjoyed your photos. I often drive and walk along Myrtle but now realize I don't often enough stop and see it. I do, however, feel compelled to mention that the brick complex on the corner of Myrtle and S. Swan was part of not one, but two of Albany's breweries. 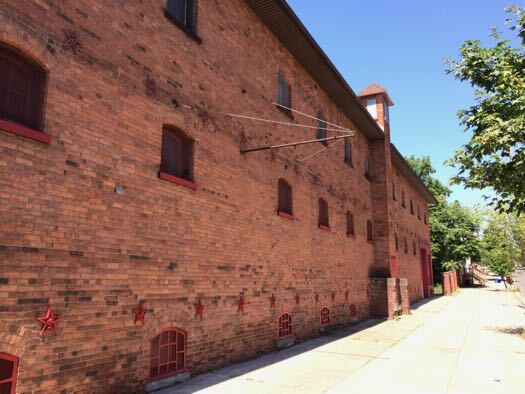 It was originally built as part of Hinckle Breweryâ€”as their stables, and barrel storageâ€”in the late 19th century, and eventually taken over by Dobler brewery in the 1940s. 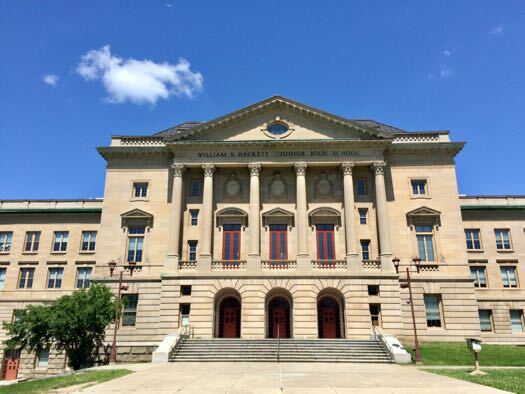 Dobler was originally across the street from Hinckel, where the Executive House Apartments are today, but the expanded into the vacated Hinckel brewery in the years after prohibition. One rainy evening in late October 1978, as I was driving on Myrtle, just past Ridgefield, a man suddenly stepped from between two parked cars directly in front of my car. Before I could brake, he quickly jumped back. In that fraction of a second, I saw in my headlights the then well known profile of long time Albany County District Attorney Sol Greenburg. He was out campaigning door-to-door for his first reelection bid. After that, when ever I saw him on the TV news, I would recall the night he came so close to an early end to his career on Myrtle Avenue. I'm always walking so I'm always looking at the places I pass, whether they're regular homes or fancy old church or odd lots. I'd love to see more articles like this, too! If there were a "love" option like Facebook has, I'd be clicking it repeatedly! This is great !! Makes me miss my old neighborhood even more . Thank you ! 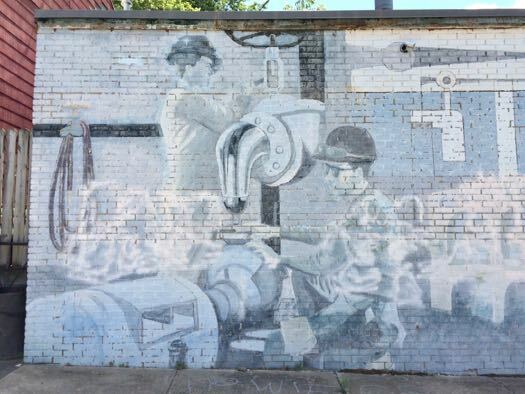 The plumbers hall with the great mural, repurposed as a residence, on the northeast corner of Myrtle at Ontario was Coles Candy Store when I was growing up there in the early 60's. At least I think it was a candy store because that was all I ever got there. We got our matchbox cars and balsa airplanes and superballs up at Glatz on the corner of Morris and Partridge. Mrs. Cole was an older lady in my recollection with an apron and a rather sour countenance. She did give free candy sometimes though. Kendalls Garage was across the street and Meisters Meat Market, where in the back you could see pigs and chickens killed and full sides of beef sectioned, was where the BBQ place is now. Nice to see it showcased here! Many years ago when I was right out of college & working my first "real" job at a bank downtown, I had a tiny apartment at 775 Myrtle Ave, between Partridge & South Main. It's an unusual building for the neighborhood and I always wondered what it's original purpose was. A neighbor at the time told me that she'd heard it was a dorm for a nursing school or a old convent. I'd be interested if anyone has any background on that building. @Ron: It's 1am and I just took the dog for a walk along Myrtle from Swan to Delaware. No issues to report. Myrtle/Morris is my go-to bike route when heading east/west. That may change once the Madison lanes are completed (can't wait! ), but it will always be a pleasant route through the city. Glad to see others enjoy it, too. Love this Greg, thanks for featuring our street. I would love to see more pieces like this on different corridors in the City. 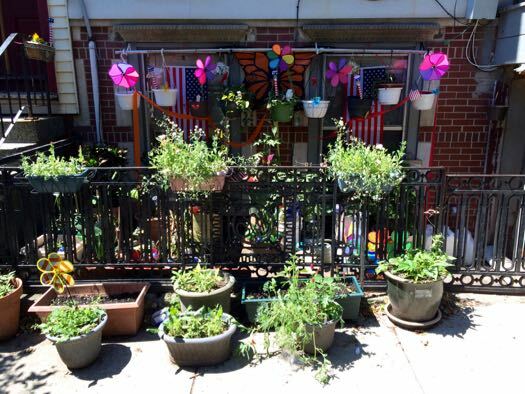 Hey, thanks for posting the great photo of my old house at 946 Myrtle. In fact, I painted that door red around 15 years ago. It was brown before that. What a great little brick house. We miss living on Myrtle! I love Pine Hills but it needs a lot of help/investment. It's amusing to read how majestic it all seems by your account - start your walk at dusk and see how far uptown you get. This city (namely the dissection you 'strolled') has turned into a wasteland of thieves, street trolls, red 'x' buildings and slum lords. I live on the corner of Myrtle in Pine Hills and over the past 12 it has gone from neighbors reminding you to move your car on odd days to your neighbors trying to steal your car on the odd day. 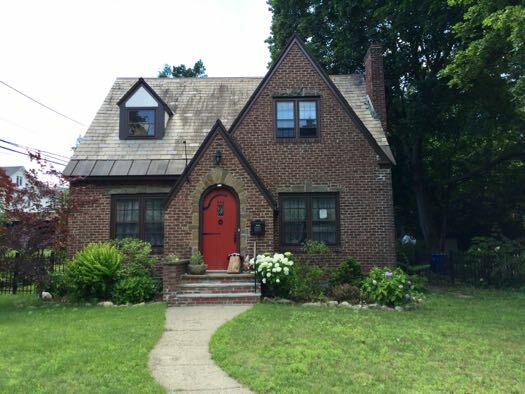 I grew up in the Pine Hills and still live in same house that my great grandfather built in 1913 on Myrtle Ave. I was hoping to see my one family home but I recognized each and every pic. Also saw my cousins home a few block away. Thanks for the great post! Thanks so much for this great post. I grew up in the Pine Hills and still live in the house that my great grandfather built in 1913. I was hoping to see my one family home but only came close. I recognized each and every picture and actually saw my cousins house a few blocks away. Again thanks. The armchair tour was fun! It occurs to me that the most important ingredient in this story is the time it took. It's slow cooking, rather than fast food. Awesome tour, Greg. I want some more! Thanks to the year roundup, I just saw the rest of these comments. Eric Luper - my mother and stepfather bought that house about 7 years ago. They love it!